The ancestors of Native Americans came to the New World by walking over a land bridge across the Bering Strait. But there’s a rather glaring 10,000 year gap in the story — one that could be explained by a migratory pause that lasted for millennia. via America’s first settlers were trapped in Beringia for 10,000 years. I’ve always thought of the idea of a land bridge as a narrow strip of land. Apparently it might have been as wide as Alaska and hosted an environment for a culture to have thrived in for thousands of years. It’ll be interesting to see if they can find any archaeological evidence for this theory. This entry was posted in Zeitgeist and tagged Alaska, Anthropology, Archaeology, Bering Sea, Bering Strait, Beringia, Dennis O'Rourke, Genetics, land bridge, Native Americans, Native Americans in the United States, New World. Bookmark the permalink. I remember Charles Mann’s 1491 pointing out that it was surprisingly hospitable considering the location. It wasn’t any worse than the present day Arctic IIRC. I’ve never thought of the Bering Strait as particularly hospitable. From what I’ve read about the islands there, they are icy and stark. 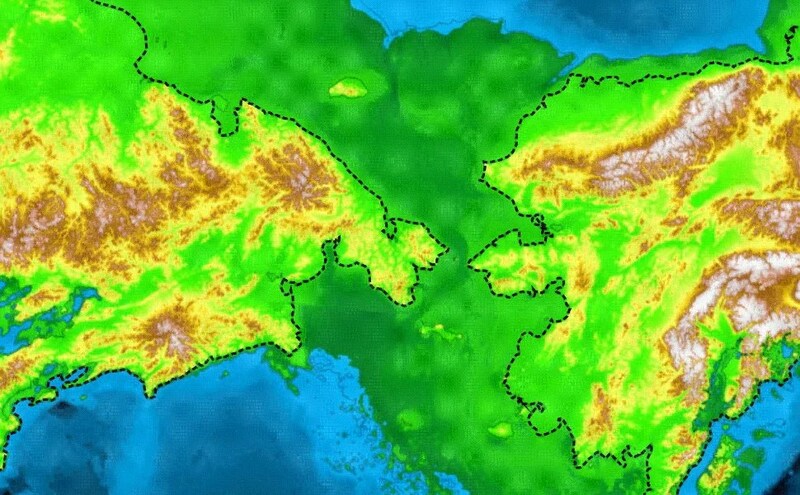 But if the land bridge was as large as the map shows, it’s easy for me to believe that the southern parts were more or less equivalent to the southern parts of modern Alaska.